A Havildar in the 1st Patiala Rajinder Sikh Infantry who was born in the village of Bhai ke Pishore in the district of Sangrur, East Punjab. As a musketry instructor in Egypt he set shooting records. His life has been researched by his grandson, Citizen Historian Lt Col Swarajinder Singh. Natha Singh was born in the village of Bhai ke Pishore in the district of Sangrur, East Punjab. As a Havildar, Natha Singh served in the 1st Patiala Rajinder Sikh Infantry. Besides taking part in operations, in July 1917 he was one of the first three instructors of Musketry of the Indian Section at the Imperial School of Instruction, Zeitoun on the outskirts of Cairo, Egypt. While at the school he studied bombing and became expert in topography. In January 1918 he became one of the school's first Range Finder instructors. He mastered the subject and wrote a Hindustani Manual in Range Finding. While there, he set shooting records in competitions against soldiers from across the British Empire. In a trial of skilled marksmanship, performed in the presence of Lt Col Depatron, I.S. of I. Zeitoun (formerly Commandant of the Army School of Musketry in Hythe, Kent, in England), he loaded and unloaded 111 rounds of dummy cartridges in a minute, fired 55 dummy cartridges in a minute, and secured 35 hits with live ammunition from 30 yards on a miniature target, again within a minute. The family believe that Natha Singh was awarded a certificate confirming the record, which was signed by Field Marshall Allenby and countersigned by King George V. They have not yet been able to trace its whereabouts. Natha Singh would tell family members about a big competition in which he was selected as the best shooter among all the soldiers of the British Empire. In June 1918, Natha Singh was recalled to his unit. The family have preserved a copy of a letter (see image) referring to Natha Singh's services at the shooting school. In it, Captain Combe writes how Natha Singh was 'not only the best instructor but the best individual performer with the rifle'. Major Shepherd, who commanded the Indian Wing of I. Zeitoun noted in a letter (see image) to Lt Col Ishar Singh (1st Patiala Rajinder Sikhs Infantry) dated 27 July 1918 that Natha Singh 'has done excellent work at the school'. In October 1918, Natha Singh demonstrated rapid rifle shooting to Maharaja Bhupinder Singh of Patiala during an inspection of the Patiala Infantry Regiment, part of 20th Brigade of the Egyptian Expeditionary Force (see image; archive footage viewable via Other Links below). 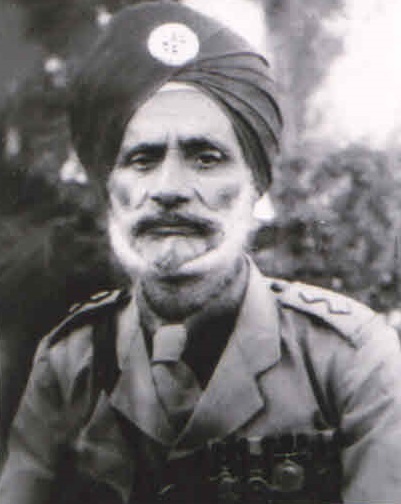 Natha Singh was injured during the war. He was awarded an Indian Meritorious Service Medal (IMSM), a long and meritorious service medal awarded to Indian non-commissioned officers in the British Indian Army. Established in 1888, the IMSM could be awarded to one Daffadar or Havildar of each of the regiments of the Presidency armies.To be awarded the medal men must have served at least 18 years, had performed in a meritorious manner and been recommended by his commanding officer. He was later made an Honorary Lieutenant. In August 1919, Natha Singh was part of a contingent of British and Indian officers and men who were invited to a reception hosted by King George V at Buckingham Palace. Large crowds gathered to watch the 'Victory Parade' procession as the soldiers made their way through London (see image; archive footage viewable via Other Links below). Copies of King George V's original address to the contingent, along with the original Urdu translation, have been preserved by the family (see images). The military tradition continued in Natha Singh’s family - two of his sons and a grandson, Citizen Historian Lt Colonel Swarajinder Singh, served in the Indian Army. In 2015, the fourth generation of the family, Gurnoor Singh Bhangoo, the great-grandson of Natha Singh, was commissioned into the Indian Army.